The land under Lake Almanor was called Big Meadows. It was a very popular resort area in the summer time. The weather was perfect and there were rivers running down both sides of the Peninsula. There were several resort hotels that were very nice and very popular. This included the little town of Prattville and the beginning town of Chester. The Stover, McKenzie, Olsen and Bidwell families were the old pioneer families that used to pasture their cattle where you see cattle pastured today. The Olsens built a rather large hotel in the southeast corner of Chester, but that burnt down in 1989. Shortly after 1900, the Great Western Power Company bought the meadowland from the cattle farmers including the land up to the 4500' level. The land above the 4500' was owned by the Walker family. The Walker family owned the town of Westwood, lock, stock and barrel. They operated the huge Red River Lumber Mill. Thomas B. Walker came out to Plumas and Lassen counties in 1894 and bought over 1 ¼ million acres of timberland. 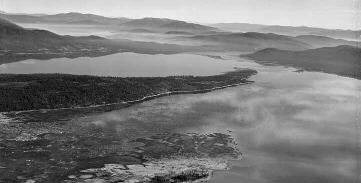 This included the Eastshore of what is now the lake, the peninsula, Hamilton Branch, and the area on the west side that is now Almanor West. The Red River Lumber Mill started cutting lumber in 1912. It was a huge mill. One of the largest, if not the largest, in the country. 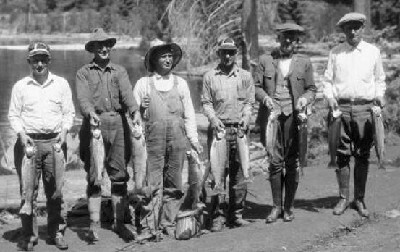 This was about the time that the Almanor dam was finished; around 1912 or 1913. The controlling heirs of the Walker family sold the mill to the fruit growers supply company in 1944, plus the land they did not sell to The Great Western Power Company or to Ed Clifford. Walker Road was named after the Walker family of Westwood. The Red River Mill burned in 1956 and the land and buildings in the town were sold for $650,000 to a couple of real estate developers from Los Angeles. They came up and sold it building by building. Ed Clifford was a Seattle Lawyer who also did some real estate developing. He bought the East shore, Hamilton Branch, Peninsula and the land used by Almanor west in 1948 and 1949 from the Walkers. In 1953, he filed incorporation papers for the Lake Almanor Country Club and filed a plat for Unit 1. Prior to that time however, he had developed some land along the East shore. 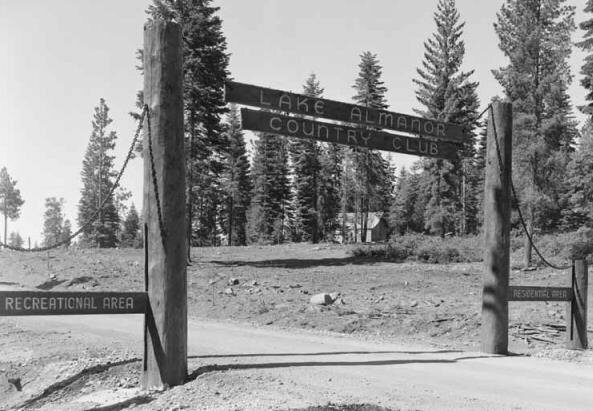 Ed's idea for the Lake Almanor Country Club, was a private country club in a common consent subdivision where the owner members would need to be approved by a member committee before purchasing a lot. This idea proved impractical, but for many years two member sponsored signatures were required on each sales contract. Common Consent was a matter of statutory law in California within the business and professions code. It provides for a subdivision where each member/owner surrenders some of his usual property rights to all of the others in consideration for them doing the same thing. The purpose is to have a subdivision that is monitored and governed to an extent by a Board of Directors that are elected democratically by the member/owners. The Board makes the rules for living, architectural, provides for safety and security and the amenities that LACC has. In other words, it is a very special type of subdivision. To make a long story short, by purchasing a lot here, we all agree to all the provisions of the CC&R's, Articles of Incorporation, By-laws of the incorporation of the Lake Almanor Country Club, and any rules of conduct enacted by the Directors and not over turned by a majority vote of the members. The Mutual Water Company owned by the members was incorporated in August 1962 as a separate corporation. Actually the golf course was originally an autonomous corporation. Ed Clifford, who still owned the golf course at that time, asked me to head the first golf course management committee. I appointed Ed Clifford, Len Harkness, Malcom Sykes and Al O'Brian. Almanor West was also established by the Clifford family. It is interesting to know that Ed Clifford deeded all the land he owned at Hamilton Branch to a paving contractor known as Slim Malovich in consideration for him paving the roads here in the peninsula of Lake Almanor Country Club. This turned out to be a pretty stiff price. In the summer of 1962, I was driving by the gate at the Peninsula Drive and Ed Clifford had his Real Estate office just outside the gate where Lake Almanor Real Estate now is. Ed motioned for me to come in and he explained that he wanted to show me where he was going to put the golf course. I went with Ed and we drove up to the north end of the peninsula above the Lake Almanor Country Club land. We got out of the Jeep and hiked through the woods for 20 minutes to a half an hour. I told Ed that I did not know that he owned land this far north. Ed responded 'that he didn't, the fruit growers own it and they don't want to sell it to me but they will sell it to me one day.' I told Ed that we were not getting any younger and I would show Ed where to put the golf course so we could get it built in time for us to use it. So Ed and I got back in the Jeep and I directed him to a point just about where the pro shop stands. I pointed out that there was all this open area since the redwood trees between fairways 1 and 5 had not yet been put in. It was open all around Number 1, 4, and there was room for 2, 3, 7, 8 and 9. As we were talking, Bill Taylor who was the sales manager, drove up. He and a young man got out of the car and Bill introduced this young man to Ed. Bill explained that Mr. Jones and his father were dirt grading contractors and they had finished a job and were about to take their equipment home. They were wondering if Ed had any work for them to do before they left. Ed looked out over the lake for a moment and asked them to be back on Monday to start the golf course. Thank goodness for that blessed event. LACC started with holes 1, 4, 5 and 6. There was a little stand with a box and a hinged lid near the clump of trees by the ladies tee at #6. Inside the box were Xerox copies of golf cards for holes 1, 2, 3 and 4 repeated two more times. There was a cigar box where the players put their $1 and they would then play as many holes as they wanted to play. Of course there were not too many here to play at that time. The holes were engineered by Ed's engineer Tony Brogunier. He was assisted by Louis Bertoloni who was National President of Greens Keepers Association so he should know what he was doing. In 1965, Ed put in holes 2 and 3. So then they were able to play 1, 2, 3, 4, 5 and 6. In 1966, he put in 7, 8 and 9. I sat in with him, at his request, when we had the contract for the sprinkler system on 7, 8, and 9. Funny thing happened though, Tommy Allen, a very nice chap, who was a neighbor of mine on the Peninsula, was in charge of grading 7, 8 and 9. Because I was the Chairman of the golf committee, I came up that fall to see how the thing was coming. At the bottom of the hill between the 7th and 9th fairways where the water normally runs during the winter time, was a huge pile of dirt. I asked Tommy what he was stock piling the dirt for. Tommy told me that was going to be the 8th green. I told Tommy that he had to be kidding because he could not put the 8th green there. Tommy asked why not and I told him that the people coming down on 7 wouldn't dare hit a ball with someone on that green and the people on 9 wouldn't dare drive with anybody on the green. Tommy asked me where to put it and I told him to put it where it now exists. Jim Bambino was the green superintendent at LACC for 19 years. I can remember well the day when I took Mel Sykes and Al O'Brian up to McCloud where him and the family lived. They were in the lumber business. Jim was the greens keeper at the McCloud Country Club. We went up and played the nine holes and he had just put in a new green and apparently he had done a good job. Dete was handling the snack bar up there. We talked to them and liked what we saw and heard. LACC hired them and they came to work in the spring of 1972. You might be interested to know where the greens keeper's home came from. The greens keepers home is a double wide mobile home which is suppose to be taboo in the Country Club. There are no manufactured homes. One day Ed Clifford called me and appeared to be in some distress. He asked me to meet him at the Fire Hall. When we arrived, there was a double wide mobile home all ready erected. There was a concrete foundation for another one and it was standing there on wheels ready to be put on the foundation. I asked Ed when this all happened and Ed told me that it all happened within the last few days. After talking to the man, he agreed to sell the second mobile for what he paid for it in exchange for Ed letting him leave the one he had already put in. Ed and I agreed to this. The mobile was moved up and put on a foundation, with a roof and deck. This became the greens keepers house and it was a big help because it was part of the greens keepers compensation. As a member of the Board of Directors from 1969 to 1979 we used to meet at the Clifford home on Peninsula Drive. On the lake front side there is a little balcony up there and they had a long table up there with eight or ten chairs. This was where we met. Bill Taylor, the sales manager, used to come in once and awhile and listen, but you could not of had an audience like we have today. Every year after the Annual meeting, the Clifford's would have the Board of Directors and their wives come over for a picnic in the yard down by the lake. Ed Clifford played golf, but wasn't the best player in the world, but he enjoyed it and he played a fair game. One day on the ninth tee, Ed hit the cedar tree at the top of the hill and his ball came back. So he set up another ball and he hit the tree again. He teed up a third ball and he turned to the other three men in the foursome and said 'now if I hit that again, it is coming out'. Since he owned the golf course at that time, he would of taken it out. The first year that Jim Bambino was here, he wanted to take out the cedar tree that now strikes out over half of the #4 green. I told him that the course was too short and too easy as it is and to leave the tree. Unfortunately it has grown out about another 10 feet and there have been times I wish I had let Jim take it out. In October of 1972, Ed called and wanted me to prepare a contract that would deed the golf course free and clear of any encumbrances to the members. There were two conditions: the first condition would be that if it was not used as a golf course, the title would revert to the Clifford heirs. The second condition is that Ken Walker and his family would always have membership privileges in the Country Club. I drew up the contract and Ed signed it. The next time I saw Ed, I asked if he had put the deed on record. Ed had not done it but said he would get it done pretty soon. I said that I would feel more comfortable when I got home if I knew that the deed was on record. Ed told me that he would have it on record in a week and he did. That winter Ed died. I don't think that it would of made any difference, but it might of created some problems in completing the deal. In 1979, there were a couple of significant things that happened when I was president. The first was a tentative contract to repave 17 miles of the roads at the cost of $500,000 plus a 10% commission to an outside engineer.. Ed Anderson of Rolls, Anderson and Rolls was on the Board. Phil Harris was also on the Board and he was with Caltrans. I thought that it was stupid to pay $50,000 to an engineer; LACC had Board members who could do it. I got the Board to cancel the contract and LACC hired another paving contractor who did it for $240,000 without any 10 % fee. So this was our first good deal. The second was the old Red Barn behind the Real Estate office at the Peninsula gate. This was the corporation yard. The doors were not big enough to get the biggest equipment in. The Fire Department had condemned it as a fire hazard. It was difficult to get to. At one time, taking the grader through the gate caused several hundred dollars in damage to the gate. Bill Taylor offered to buy it and for $47,500. However, he was on the Board of Directors. Technically, there was no reason why he could not buy it as long as he did not participate in the deliberation of whether or not to sell. However, there was a young lawyer on the Board that felt that since Bill was a member of the Board he should not be able to buy it. In the mean time, I was having a separate appraisal made for the Board. The appraiser came up with a figure of $37,500 which shows that LACC would be getting $10,000 more than their own appraiser had appraised it for. After much battling back and forth, both publicly and privately, the Board voted to go for the $47,500. That money was just enough to put up a nice big metal building below the lower tennis courts just northeast of Fire Hall #2. It has big doors on it and LACC can get all the equipment into it. It is able to be used in the winter to repair equipment and it has been a very good deal. The third item was a call that I received from Bill Finkbeiner after Ed Clifford passed away. Bill had apparently taken over the management of the Clifford affairs and asked to talk to me about an important matter. Bill told me that they wanted to deed to LACC the 15 acres that are not developed plus two lots. One of the lots was on Hidden Beach Road and was valued at $65,000. The other is where the gate is located on Clifford Drive. Bill wanted the Board to give them a quit claim deed so that they would have no further obligations of any kind to the Country Club. All the lots were sold and the Clifford heirs are out of it clean and clear and LACC could have all this property. Bill knew of no other obligations that he had. Off hand it sounded like a good deal to me. I called a special meeting of the Board and no one knew of any reasons why the Clifford's still owed LACC anything. The Board entered into the deal and acquired the 15 acres that has been the subject of much discussion but still is a valuable piece of property. Of course, the lot where the gate is located has been very valuable to us. I believe that the other lot was sold after I went out of office. At one time, Ed Clifford was considering having 9 holes of golf at LACC and the other 9 holes would be played at Lake Almanor West. There would be a road down to the lake edge where there would be a dock. At the dock would be a barge that carried two golf carts and four or five people. After playing 9 holes here, they could go across and play 9 holes at Lake Almanor West and then come back. There would now be a 18 hole golf course but it would have a lake between the ninth and tenth holes. Because of the rough winds and storms, it was not a safe project and it was called off.